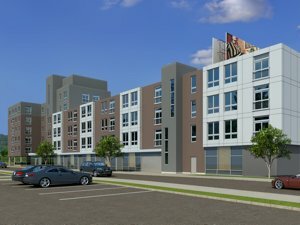 BOSTON, MA: EagleBridge Capital, working exclusively on behalf of its clients, a joint venture of The Grossman Companies and Waypoint Companies, has arranged construction/permanent mortgage financing in the amount of $20,500,000 for 61-83 Braintree Street located in Allston neighborhood of Boston. The mortgage financing was arranged by EagleBridge principals Ted. M. Sidel and Brian D. Sheehan who stated that the loan was provided by the Brookline Bank. The apartment building shall contain 80 units as well as ground floor commercial space. There will be 51 studio apartments with the balance of the units comprised of one and two and three bedroom apartments. The units will feature premium contemporary finishes with kitchens featuring the latest stainless steel appliances, granite countertops, and modern cabinetry. The building will feature a rooftop deck, fitness center, bicycle storage area and 68 parking spaces. The complex will target the young professional, recent graduate, and graduate student market due to its central location within easy walking distance of area shops, pubs, and restaurants and its proximity to downtown Boston, the Longwood medical area, and Cambridge. A Super Shop & Shop is located within a few minutes’ walk. 61-83 Braintree is also located within a short walk of Boston Landing, a mixed use development, which is under construction. It shall contain New Balance Athletic Shoe’s new 250,000 sf world headquarters, mixed-use office space, retail and restaurant space, a boutique hotel, a fitness facility, and a new commuter rail station on the Framingham/Worcester – Boston line. EagleBridge Capital is a Boston-based mortgage banking firm specializing in arranging debt and equity financing as well as joint ventures for apartment, industrial, office, and r & d buildings, shopping centers, hotels, condominiums and mixed use properties as well as special purpose buildings.